The bestselling guide to interior design updated and expandedfor a new generation For over three decades, Francis D.K. Ching's integrated,comprehensive approach to presenting the elements of architectureand design has helped millions of students and professionals alikevisualize and make sense of complex concepts. 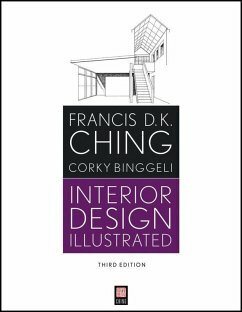 As functional as itis beautiful, this richly illustrated Third Edition ofChing's classic, Interior Design Illustrated, is a visualintroduction to designing for interior spaces, to the buildingelements and environmental systems within them, and to the detailsof furnishings and interior finishes. 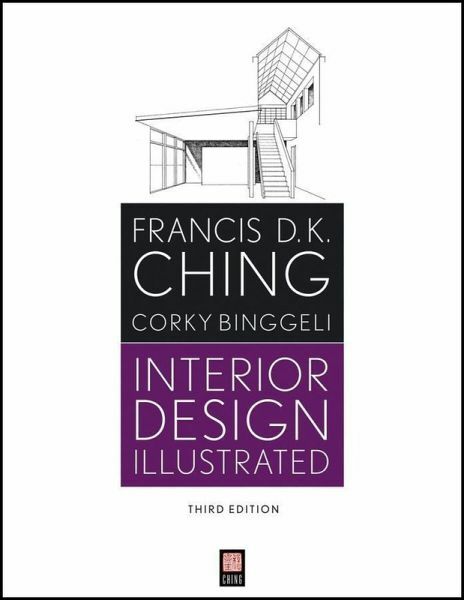 Beginning designers willappreciate this updated and expanded edition's for its concise andaccessible presentation of key concepts and practices, whileestablished designers will cherish it for its many practicalinsights into the relationship between building structures andinterior spaces. * Updated and expanded to include new information on buildingcodes, building information modeling, and sustainability * Includes new content on Indoor Air Quality and other issues inenvironmental systems, as well as the latest on data/communicationand security systems * Now features a richly illustrated section explaining the roleof color in interior design, along with teaching resourcesavailable online * Updated and expanded for a new generation of students andpractitioners, Interior Design Illustrated, Third Edition issure to remain the standard reference for many years to come.